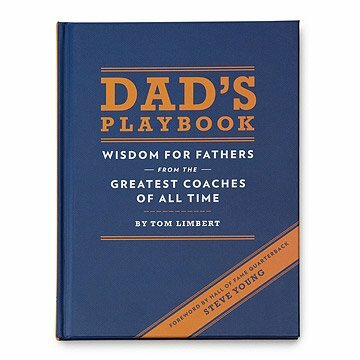 This game-changing book is filled with inspirational sports quotes for rookie dads. For new dads, having a baby is a whole new ball game, with new reasons to cheer and challenges to tackle around every corner. You can help keep his head in the game by inviting him to huddle up with this sporty playbook. The text is full of quotes and insights culled from dozens of sports' greatest coaches, with advice on being a leader, scoring under pressure, and how to encourage team spirit. Comes illustrated with inspiring photos of coaches at work. Made in China. This was a gift. My brother read through a few pages and said he really loved it. Great gift for a dad with sporty kids! My brother said it's very easy to pick up and read quickly. my dad loves this book more than I ever could have imagined! My Dad loves this book beyond my wildest dreams! This was great for our long wait times at the doctor. This was the perfect gift for my husband. We are going to be parents in June and he is a huge sports fan, so this really combined two relevant things for us! He loved the quotes from some of his favorite coaches of all time and though the book has so far been very informative. I would recommend to any expecting sports fans out there! I gave it as a gift to someone who enjoys sports and coaching quotes.